I have been using the sap.ui.core.message.MessageManager for a while now. What I really like is the ease in which it handles messages raised on the Client side and the Server side in almost the same way. One of the nice features of the Message Manager I especially like is the ability to link a message to a target field and bring the attention of the message to the user. In this blog I will demonstrate how to trigger and show back-end BAPI Warning, Error, Information and Success messages without throwing exceptions. The Gif below shows an example of server side messaging, initially showing messages included in the http header and after that showing messages in the response body as part of business exception. There are numerous use cases, the one that is front and centre in my mind is a BAPI simulate scenario. Your application allows the user to change multiple lines and post the changes in a batch request. The changes are processed through a BAPI and you wish to inform the user of warnings and information relating to the data changes before committing. When processing BAPI messages in our Gateway service, we can either chose to add the messages to the header property “sap-message”, this will send a HTTP 204 response, telling the app the call was successful, else we can throw an exception, which it will send a HTTP 400 response and add the messages in the response body and the call of course will result in a failure. LOOP AT lt_return ASSIGNING <fs_return>. iv_message_target = CONV string( <fs_return>-field ) ). To get the message to show inline our Input fields, we can use IV_MESSAGE_TARGET, in this field we want to put the binding context path for the field. I wrote some code for the creation of header and body messages for mockserver requests, handy if you want to test server side field validation. Thanks for nice blog post. Great blog John. We’ve just gone live with a Goods Receipt app which called the BAPI in test mode as each item was saved. This approach would be great for something like that. It’s good to know that we can pass warnings back without triggering a 400 response. Yeah that was the kind of scenario i was thinking of, various business rules around tolerance and price limits need checking before posting. If you go over or under, its not necessarily an error, but you do want to highlight a warning to the user, so they get a chance to make adjustments. 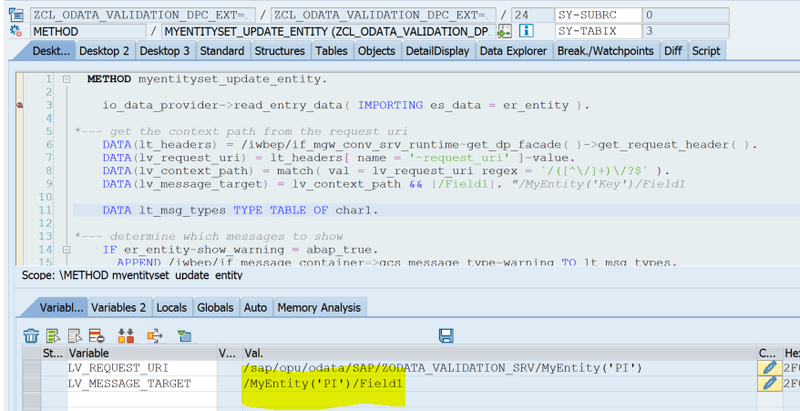 when i use the batch mode for the oData, it removes the “first ariving” message. Any idea? many thanks for this nice blog! It is working fine in update-entity scenario’s for me. But when i create a new entity the error and warning messages are not being displayed . Could the problem be, that i don’t have an id for my EntitySet to fill the key-field in the method add_message_from_bapi ?